In 1981 the Apartheid government created KaNgwane a semi-independent homeland for the Swazi people consisting of two territories at the border to Swaziland and a third one somewhat to the north, at the border of the Kruger National Park; the three having a total area of 3,000 km² (1,158 sq. mi.) populated by 183,000 inhabitants. In 1982, the Apartheid government temporarily suspended the semi-autonomy of KaNgwane, but restored it in 1984. Dr. Enos Mabuza , the Chief Executive Councilor of KaNgwane and leader of the Inyandza National Movement, however, refused accepting an Apartheid sponsored independence, adopted for example by Transkei, Ciskei and Bophutatswana. In 1986, Dr. Mabuza led a 21-person Inyandza delegation to meet leaders the exiled African National Congress (ANC) in Lusaka, Zambia. He publicly and repeatedly called for the release from prison of Nelson Rolihlahla Mandela (8 July 1918 – 5 December 2013), also affectionately known in South Africa by his clan name Madiba. When Madiba was finally released, Dr. Mabuza invited him to come to the Lowveld and stay at Bongani Lodge in the shadow of the Malelane Mountains. Mthethomusha Game Reserve, where Bongani Lodge is located, comprises 8,000 ha of rugged terrain with a diversity of interesting ecosystems, abundant wildlife and unspoiled nature on the south western border of the Kruger National Park. It became immediately apparent that Madiba loved the clean air and unfettered surrounding of the bush, and the teeming wildlife at Mthethomusha; he took every opportunity in his busy schedule to visit the reserve. Already during his second visit he spent much time in the field with the rangers and left his state-provided bodyguards back at the camp. Madiba, in his unmistakable open and friendly attitude, came to know the staff by their first names. In March 1992, the reserve management was removing surplus male blesbok in Songimvelo as part of the reserve’s sustainable utilization policy. When asked whether he would like to hunt a blesbok Madiba agreed, but was rather firm requesting for appropriate marksmanship training under expert tutelage. Madiba handled the rifle very well and proved to be an excellent marksman. He told his trainers about him learning to use a rifle in Ethiopia. Later he admitted that the only time he had shot anything was when he used an air rifle shooting doves, when hiding under the pseudonym of David Motsamayi at Arthur Goldreich’s Liliesleaf Farm in Rivonia. This episode is described on page 268 in Madiba’s acclaimed book Long Walk to Freedom (the autobiography of Nelson Mandela, first published in 1994 by Little, Brown & Co UK, IBSN 978-1-4087-0311-3). 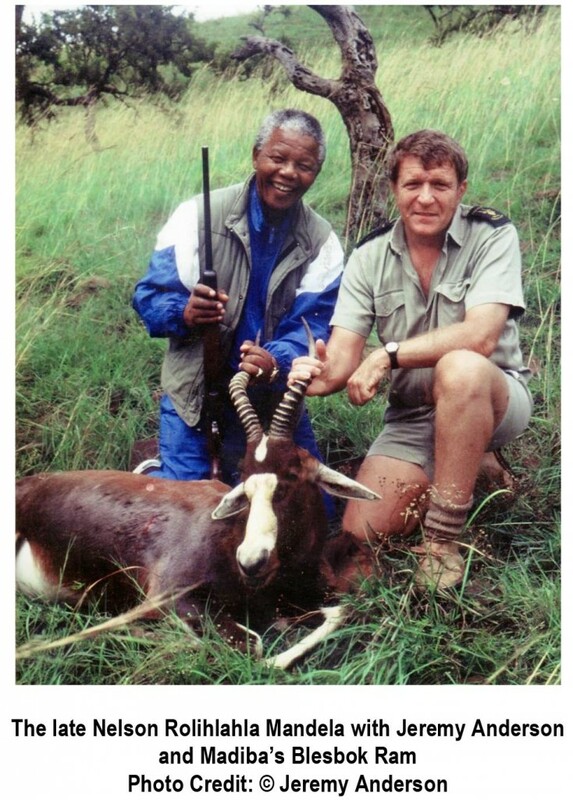 After Madiba had satisfied himself that he could consistently place clean shots into the bull’s eye, the hunting party went out in search of blesbok. Peter Hitchins, the then warden of Songimvelo knew where most of the blesbok congregated on the reserve. Madiba and his guide were able to stalk a blesbok ram to about 80 meters. Madiba calmly took aim, and brought it down cleanly with a single shot. Afterwards he mentioned that he had suffered from the shakes and a good dose of buck fever during the crucial moments before firing the shot. Jeremy Anderson was amongst them who reassured Madiba that it was perfectly normal for most first-time hunters, and also for old hands to the game, to suffer from these bouts of shaking when about to taking the life of an animal. Madiba of course took the meat of the blesbok home. During a following visit, he proudly told the rangers how good it felt eating the blesbok venison with his family and friends. At a later date, Madiba hunted again in Mthethomusha; this time for an old impala ram, which he harvested also with a single clean shot. After Madiba became president of South Africa and the ANC the governing party, South Africa has made significant progress in increasing the number and area of national parks in the country. Together with Anthony Rupert, Madiba co-founded the Peace Parks Foundation (PPF) in 1997. PPF works to establish transboundary protected areas that preserve animal migration patterns and share wildlife resources.